The chief minister won the Jhalrapatan seat with a margin of 34,980 votes by defeating her nearest rival and Congress leader Manvendra Singh. 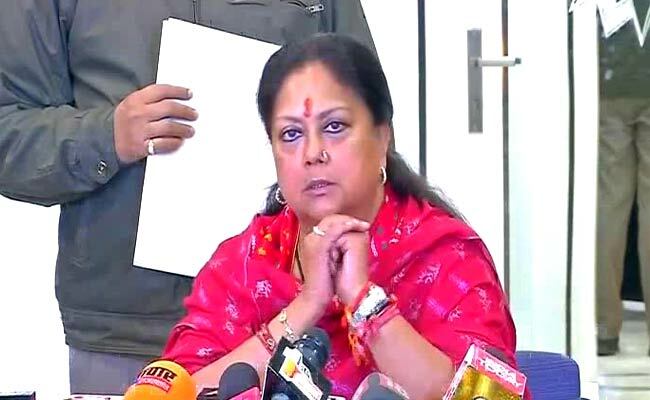 As many as 13 of 19 ministers in the outgoing Vasundhara Raje government have lost the Assembly elections in Rajasthan as results and trends brought electoral reverses for the ruling Bharatiya Janata Party (BJP). Ms Raje (Jhalrapatan), Home Minister Gulab Chand Kataria (Udaipur), Education Minister Vasundev Devnani (Ajmer North), Women and Child Development Minister Anita Bhadel (Ajmer South), Parliamentary Affairs Minister Rajendra Rathore (Churu) and Higher Education Minister Kiran Maheshwari (Rajsamand) have retained their respective seats. She had won the seat in 2013 elections with a margin of 60,896 votes. Minister Surendra Goyal (Jaitaran) and Devsthan Minister Rajkumar Rinwa (Ratangarh) had turned rebel after the BJP denied them ticket and they contested the elections as Independents. Both have lost their respective seats.